The World Affairs Council of Western Michigan presents a 3 part lecture series on Central Europe featuring diplomats who have served in the region. Here, former Croatian diplomat Dr. Jelena Polić highlights her career and the importance of keeping an eye on Central Europe. Central Europe is a region of the world that has been fought over for centuries. There is both remarkable diversity and shared identity among the nations that make up Central Europe. Core countries that form the region include: Poland, Hungary, Austria, the Czech-Republic, Slovakia, as well as some of the successor states of the former Yugoslavia. At the crossroads to much of the world, the people there have long had shifting borders and allegiances. With questions about the future of the EU and Russia sowing discord in the region and elsewhere, Central Europe will remain in the cross-hairs of history. Join us for an engaging series where our experts discuss the role of strategic alliances such as the European Union and NATO in Central Europe. Todd Huizinga, US diplomat (former), served as Deputy Chief of Mission at the US embassy in Luxembourg and was a Political Counselor at the U.S. Mission to the EU in Brussels. A graduate of Calvin College, Huizinga is currently a senior fellow at the Paul B. Henry Institute there. Jelena Grčić Polić, Croatia/EU diplomat (former), most recently served as Consul General of Croatia in Chicago. 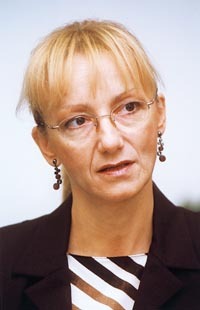 ﻿Among many high level positions in her career, Polić was Croatia's Deputy Permanent Representative to the United Nations in New York (one of only 9 women serving in that role at the time). She received a Ph.D. from the University of Pennsylvania and her LL.M. from Harvard Law School. Mr. Huizinga will begin the series with an overview of the complex and troubling developments in Poland and Hungary as case studies to the region. What are the roots of the profound tensions between these two countries and the European Union? How are Poland and Hungary affected by -- and what role do they play in -- the rise of populist, anti-establishment movements that are refashioning the political landscape throughout Europe? Dr. Polić continues the discussion by emphasizing security and defense policies in the region. In light of an expanding Russian presence and their increasingly effective influence within Central and Eastern European (CEE) states and markets, what new responses are needed from the West, especially the US, if the ultimate Russian goal is Restoration and control over former Soviet satellites? Mr. Huizinga and Dr. Polić will end the series with a moderated panel on the role Central Europe might play in America's foreign policy under the Trump administration in light of these challenges facing the region. (Grand Rapids, MI) The last several years have seen a backlash towards globalization, as seen by political rhetoric that brought electoral victory to Donald Trump; the Brexit vote in the United Kingdom last summer; and rising nationalism in Europe and around the world. Yet, countries need to work together now more than ever as complex issues such as climate change and terrorism that in many places challenge national and international security can only be solved through global cooperation. Diplomacy is vital to these efforts of multi-national cooperation, as it protects national interests while allowing collaboration with other countries. Recently, the World Affairs Council of Western Michigan sat down with former Croatian diplomat, Dr. Jelena Grčić Polić. She will speak before the Council’s members and the general public as part of a lecture series on Central Europe, with co-presenter Todd Huizinga, a former US diplomat. Dr. Polić’s career as a diplomat grew alongside Croatia’s Foreign Service, just 25 years old. She served in many high level positions throughout her career and most recently served as Consul General of Croatia in Chicago for the Midwest, including the state of Michigan. She is now retired and lives with her husband here in Grand Rapids. We asked her to describe some of the highlights of her career, the opportunities and challenges of working in Foreign Service and what’s next for the region she hails from, Central Europe. World Affairs Council: You grew up in Croatia, which was a part of Yugoslavia until Croatia declared independence in 1991. Yet, you’ve spent much of your adult life abroad, first through education and then later as a Croatian diplomat serving your young nation. How and why did you transition into diplomatic service? I grew up in the city of Dubrovnik on the coast of the Croatian Adriatic Sea when it was a part of the former Yugoslav (South Slav) Socialist Federation. Due to its history as an independent, rich and enlightened city-state, from the Middle Ages until it succumbed to Napoleon in 1808, Dubrovnik enjoyed special status as an arts and tourist mecca in the former Yugoslavia. Already in 13th century Dubrovnik Republic had developed a diplomatic-consular service to protect (its) liberty, which it valued so much that it formally abolished the slave trade in 1416. Like Venice and Amsterdam, the walled city of Dubrovnik was designated by UNESCO as the world cultural heritage site. Hence no one expected that this city, dubbed the Pearl of the Adriatic by Bernard Shaw would be brutally shelled and kept under siege for months in the winter of 1991/1992. Unfortunately, this came about when Croatia and Slovenia, two out of six Yugoslav republics, declared independence following the multiparty elections in spring of 1991 that brought to power non-communist coalitions and the Serb-led Yugoslav National Army attempted to avert the dissolution of the former communist-led federation by force. At the time I just began writing my dissertation at U. Penn’s Annenberg School for Communication (on the US policy formation in the area of advanced television systems and services) and was living in Philadelphia with my husband and daughter. As an officer of AMAC Mid-Atlantic (Almae Matris Alumni Croaticae), a Croatian universities alumni organization, together with my husband, I joined various humanitarian efforts to assist the needy and stop the war in Croatia. In that capacity I attended Croatia’s formal admission ceremony to the United Nations in 1992. There, I met several of my former law professors and fellow students from the Zagreb University Law School who held senior diplomatic and related government positions. They explained the many needs and challenges of building a newly independent State, including its diplomatic service from scratch. They asked me to join the service, while reassuring me that a political party membership was no longer a requirement as in the past. A year later, with my Ph.D. in hand, I agreed to assist the first Croatian Ambassador to Washington, a law professor and an old friend, to, as he put it, “do something on the Hill”, because I had spent a year doing my doctoral research in Washington, DC. Also, I was an active board member of the Washington-based “Rebuild Dubrovnik Fund”, co-chaired by Michael York (the actor). So, supposedly, the latter, in conjunction with my advanced degrees in international relations and international law from Zagreb and Harvard Law School, should have qualified me for a pioneering job of setting up the Croatian Embassy’s Congressional Affairs Office. It was all a dauntingly complex, all consuming, never ending, enormously demanding, draining and utterly fascinating work. I had the privilege to meet and work with some of the foreign policy heavy weights in the US Senate and House; I have learned tremendously from them and their extraordinary staffers. At the time, I had gained US Permanent Resident status, but since I also worked on politico-military issues, it became an impediment and in 1994 I relinquished it in order to act in full diplomatic capacity. World Affairs Council: How is the Croatian Foreign Service different perhaps than US Foreign Service? The Croatian career diplomatic service is only 25 years old and is still in the process of being defined by professionals and politicians from within and from without. The specific law governing the service in Foreign Service, unlike in the case of service in Croatian Police or Armed Forces, has not been passed yet as such. Initially, the core of the Croatian diplomatic corps was built by and around three groups: former professional members of the Yugoslav diplomacy, distinguished journalists and members of the academy, mostly in the fields of law, political science and economics, but also psychology and medicine. In a short period of two years in the early 1990’s, when it was struggling to retain its independence and liberate the occupied territories, Croatia built a network of almost 80 diplomatic and consular missions around the world. Since then, some of these posts have been closed, while new ones have opened, especially before and after Croatia joined the European Union in 2013. Presently, I believe the major difference a professional diplomat experiences when she or he serves in a mature diplomatic service like the US or in a young Croatian-like diplomatic service boils down to issues of systemic logistical support (or the lack of); continuity and predictability of enforcement of administrative rules and regulations that govern various status issues and career planning; and possibly disproportionate difference in salaries when posted abroad or at the headquarters at home. Another important difference which I have witnessed firsthand stems from the sheer size of a diplomatic mission staff. In every single one of my postings, in addition to my nominal title and area of work assignment, I have also performed the tasks for which larger missions would have whole departments or at least one diplomat and one administrative officer tasked with that portfolio: be it a: public diplomacy officer, legal counsel, press secretary or spokesperson, speech writer, translator, science and technology adviser, economic and/or trade specialist, protocol officer, chief administrative officer, etc. However, with cuts and other austerity measures, I understand that US diplomats have been experiencing, in addition to security and personal safety risks, increased hardship in multitasking and short-term overseas assignments. World Affairs Council: What interested you about the work you were doing? What excited you about the work? What were your biggest challenges? What posting did you find most exciting? I always have been drawn to the openings in reformist or even crisis-driven events and processes that lend themselves to a creative influence. I believe this comes from my upbringing under a one party system wherein space for autonomous and creative action in societal institution building was limited or dangerous. This is why I was fascinated by the creative potential of public international law, as well as the interface of new technologies, their dominant societal uses and regulatory architecture that may both enhance and suffocate their further development. During my first posting with the Embassy in DC, I was keenly aware of the importance of understanding, reporting on and explaining the differences in perspectives on a number of critical events and historical process that have been simultaneously taking place on the ground in Croatia and elsewhere in former Yugoslavia, in the major European capitals and in Washington. Following and interpreting differences in leanings or even a slight shifts in established positions of a few key Departments and offices within the US Administration, Senate and House Committees or even individual members, as well as in public or informal positions of foreign policy experts in influential think-tanks, constituted a daily challenge for me in the era when the internet was still in its infancy. But, as always, and I believe this might hold universal for all diplomats, especially on overseas postings, the greatest challenge often lies in communication with one’s own government. In January 1998, I moved from DC to assume the post of Croatian Deputy Permanent Representative to the UN in New York. I remember one question I was repeatedly asked upon my arrival by many, including the Russian Permanent Representative Lavrov: “How do you find the difference between serving here or in Washington?” And I also remember my answer at the time: “In Washington one cannot miss the gravitas of real in-your-face power, while here in the diplomats’ world one feels an illusion of power”. The UN Organization, with its six permanent organs and over 190 Member States at the time was large, complex and moved at a slow pace. The quality of human stock was extraordinary; most of the top diplomats served at the UN in New York at some point in their career. I grew more patient and focused my energies to the field of peace and security, and especially peacekeeping. Thus, as a member of the UN expert team on peacekeeping, I was privileged to attend the 10th anniversary of Namibia’s independence in 2000 and help draft the so called Windhoek Declaration. My colleague, Deputy Permanent Representative of South Africa, later adapted the Declaration for the successful adoption by the Security Council in October the same year. The resolution (S/RES/1325) became known as the landmark document on women and peace and security. Other highlights in New York entailed the successful peaceful reintegration of the Serb-occupied Eastern Slavonia into Croatia, and the closure of all UN peace keeping missions on Croatian soil. I was also happy to contribute to and witness the equitable resolution of the legal status, including membership in the UN, of all successor states to the former Yugoslavia. I did enjoy, theatrics included, my occasional chairmanship of the Fourth Committee (Political) of the UN General Assembly and the UN Committee on Public Information. And, as always, I have conceived and managed several public diplomacy projects. My favorite was a month long Croatian Food Festival at the UN Delegates’ restaurant in 1999. Next, I assumed the position of Head of North America Department at the Croatian Foreign Ministry in Zagreb just a couple of months before 9/11. Together with my colleagues I watched the tragedy enfold further on live TV, while worrying myself sick because I could not get through either to my husband in Northern Virginia nor to my daughter at her George Washington University dorm room. The solidarity and cooperation with the US in general and US diplomats in Zagreb at the time could only be described as unprecedented. To this day, I feel mercifully grateful for having been in a position in which I had to focus to act and contribute to the initial first policy responses. What ensued in the aftermath of this critical event was transformative worldwide, including to the entire Croatian defense and security sector. Since I played a small part in the latter, in December of 2002 I was seconded from the post of the Acting Assistant Foreign Minister for Europe, North America and Israel to Croatian Defense Ministry to head the defense policy and Croatia’s reforms in the process of accession to NATO. My work as the first female Assistant Secretary of Defense, under the first Croatian woman defense minister, turned expectedly challenging, often frustrating but also enormously rewarding. I witnessed how the whole system did learn and did grow more and more professional, despite political bickering and attempts to reverse the trend. In this post, besides the regular interaction with the NATO bodies and officials in Brussels and Zagreb, I took part in a number of high level bilateral visits. The most memorable ones were the official ministerial visits to Turkey and China. This is why, when I could not get confirmed as Ambassador to NATO, I accepted the post of Deputy Chief of Mission to the People’s Republic of China (PRC) in Beijing from April 2006 through May 2010. The highlights of this posting included the 2008 Olympic Games; the 2009 celebration ceremonies of the 60th anniversary of the PRC; the 2010 World Expo in Shanghai; and most notably, an official visit by the Chinese President to Croatia in the Jubilee Year 2009, the first ever official visit to any successor state to former Yugoslavia. I served under two ambassadors, both political appointees, who graciously ceded initiative to me in several deliciously interesting diplomatic pursuits in PRC, but also in Mongolia and North Korea, the other two countries that we covered from Beijing. Despite enormous costs exerted to my family life (my husband commuted to Beijing from Grand Rapids!) I remain profoundly grateful for having glimpsed first hand some of both the enormous achievements and limitations of an unprecedented growth rate of industrialization and urbanization in China and its political, social, and cultural implications. I never mastered the language of this incredible ancient civilization, but I would recommend to every ambitious young diplomat, entrepreneur, engineer, manager, trader, artist, politician, scientist or farmer to learn some Chinese. World Affairs Council: You mentioned being one of only 9 women who served as Deputy Permanent Representative (DPR) to the UN—what was that like and how has it changed now (or not)? However, the representation of women in posts of PRs has increased at a much slower rate. This is both surprising and disappointing, as it seems to confirm that heavy workload, but not necessarily coupled with top leadership and autonomy, continues to be readily available in professional diplomacy. World Affairs Council: What advice would you give to someone wanting a career in Foreign Service? Education, education, education! Besides pursuing a good liberal arts formal education (do not skip science, history or geography!! ), it is useful to get some exposure or training in legal method and reasoning. Good written and speech communication, command of various genres within traditional and social media are imperative, as well as knowledge of and full social and political literacy within at least one foreign language. Expertize in a scientific or an engineering field could be a great plus, as well, in bilateral and especially in multilateral diplomacy. Read, read, read, and find a good mentor or two to help you sort out through the current litter of post-factual news and commentary. Stay alert and critical but open to join a community of trust within members of the diplomatic guild. I hope the standards of professional comity and trust will survive the onslaught of seemingly an all-consuming relativism. The survival of the latter noble values remains critical to diplomatic effectiveness and thereby to the very survival of the diplomatic profession. World Affairs Council: In January, you’ll speak before our Council and the general public on Central Europe, and the perspectives you’ve gained in your diplomatic career for Croatia. Your talk on Tuesday, January 17th will focus on Russia’s influence in this region. Why are you focusing on Russia—what fascinates you about the topic and why should it fascinate our audience? The Chinese believe that human beings, especially men, mature once they reach the age of sixty. This is why I decided to retire from the Croatian diplomatic service in 2016, join my slowly maturing husband in Grand Rapids, and take an interest in what kind of the world my young grandson who is growing up in Dubrovnik will live in. In the upcoming WACWM series on Central Europe, I chose to focus on the growing influence of the Russian Federation’s soft power in several Central and East European (CEE) countries, because I was surprised by its extent, scope and effectiveness. Soft power refers to the ability of a country to persuade others to do what it wants without force or coercion (hard power). I believe this phenomenon has been quite unknown to the public in general, and especially in the United States. It allegedly reflects and confirms the Russian grand strategy to destabilize susceptible states, markets or even entire sections of societies in CEE in order to prepare grounds to renegotiate new security architecture in Europe. I felt that the Council’s rather sophisticated and knowledgeable audience would welcome the opportunity to engage in discovering the prevalent modes of the Russian use of soft power in CEE and beyond.